IEMA (The Institue of Environmental Management and Assessment) has formally announced its new membership structure and this could provide you with an opportunity to enhance your career progression, particularly if you have passed the Foundation Certificate in Environmental Management, or are currently studying for, or looking to take, the Associate Certificate in Environmental Management. IEMA has introduced two new professional membership grades to replace the existing Associate level. These are the new Associate level and the new Practitioner level. The new Associate level in the entry point for those building a career in environment and sustainability, and the Practitioner grade is intended for environment and sustainability professionals at the operational level. For further details on the membership levels and skills map see: http://www.iema.net/skills-map.html. From 1st January 2017, there will be an expanded syllabus for the Foundation Certificate in Environmental Management, and the taught course will be delivered over five days, compared with three currently. Successful completion will lead to Associate membership. From 1st July 2017 a new Certificate in Environmental Management exam (CEM) will replace the current Associate Certificate exam and will lead to the Practitioner grade. The CEM will be delivered over 15 days compared with 10 days for the current Associate course. If you have successfully completed the Foundation Certificate in Environmental Management (FCEM) within the past three years, you are eligible to join IEMA at the new Associate professional grade without further study. This also applies to students completing the FCEM before the end of 2016. 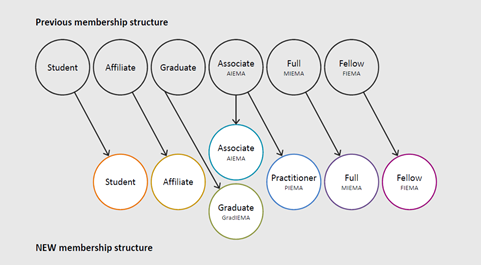 If you are already an Associate member of IEMA (AIEMA) IEMA will offer you the opportunity to upgrade membership to the new Practitioner level. If you are working towards the current Associate membership exam, and successfully take this before 28 December 2016, you will be entitled to an automatic upgrade to the Practitioner Level with no further study required. If you study towards the current Associate membership exam, and successfully take the exam between January and June 2017 you will be eligible for a fast track up-grade to the Practitioner level pending submission to IEMA of an Assessment of Competence. If you want to achieve Practitioner status without taking the new, extended, 15 day course, enrol now on a ten day Associate course, or the e-learning modules, and successfully complete the exam before the 28 December 2016.